Whiteface Mountain, the fifth highest mountain in New York, is a year-round tourist destination popular among outdoor enthusiasts. Opportunities abound for hikers, mountain bikers, and skiers. The summit offers a 360-degree view of the Adirondacks and on clear days, visitors might even catch a glimpse of Vermont and skyscrapers 80 miles away in Montreal, Canada. After the completion of the Whiteface Mountain Veterans Memorial Highway in 1935, the area gained popularity. In the same year, a vehicular bridge was installed on State Route 86 over Ausable River granting access to the mountain for approximately 2,000 vehicles each day. In 2015, it was noted that the deteriorating structure needed to be replaced. The New York State Department of Transportation (NYSDOT) wanted the project completed as quickly as possible to maintain traffic to the area, while also minimizing inconvenience to nearby residents. A twin 70' x 9'-1" BEBO® Bridge Concrete Arch System, 146' in length, was chosen as the best replacement option. The precast bridge option was selected for its quick installation, cost effectiveness, and ability to match the look of the original, historical structure. The new structure also includes decorative lighting and widened shoulders, which made the passage safer for bicyclists. Overhead utility lines near the bridge were also relocated. While determining the best type of foundation for the project, a challenge occurred. With no room for a temporary bridge on site, the project had to be completed in the spring. At an elevation of 1,100 feet, cold weather can occur at any time freezing the river. Thomas Hoffman, a Region I engineer with NYSDOT, explained the solution. "The subsurface showed the soil was littered with 5-foot boulders, so micropiles would have been the only option. An additional wrinkle was that, after the original bridge was constructed almost in the dry, a dam was constructed downstream. That made the existing footing 19 feet below ordinary water. Therefore, we decided to reuse the portions of the substructures below the waterline that had not been subject to freeze-thaw." In March 2015, the original structure was demolished and quickly replaced with the precast BEBO bridge. Total construction, including demolition of the existing structure, placement of footings, the installation of the new BEBO, parapets, backfill, pavement, and lighting, took about three months to complete. Twenty eight precast arch pieces and 16 sections of parapet wall were utilized on this project. A formliner finish was applied to the outside face while a stamped formliner finish was used on the inside face of the headwalls. The walls were then stained the same color as natural stone in the area. 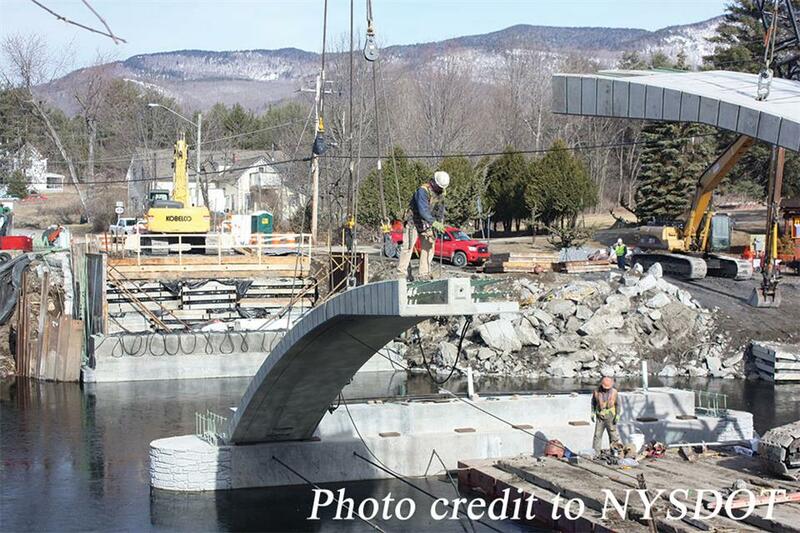 Since the structure needed to be completed by July 2015 for an Ironman competition scheduled to cross over the structure, precast was the best option for this project. 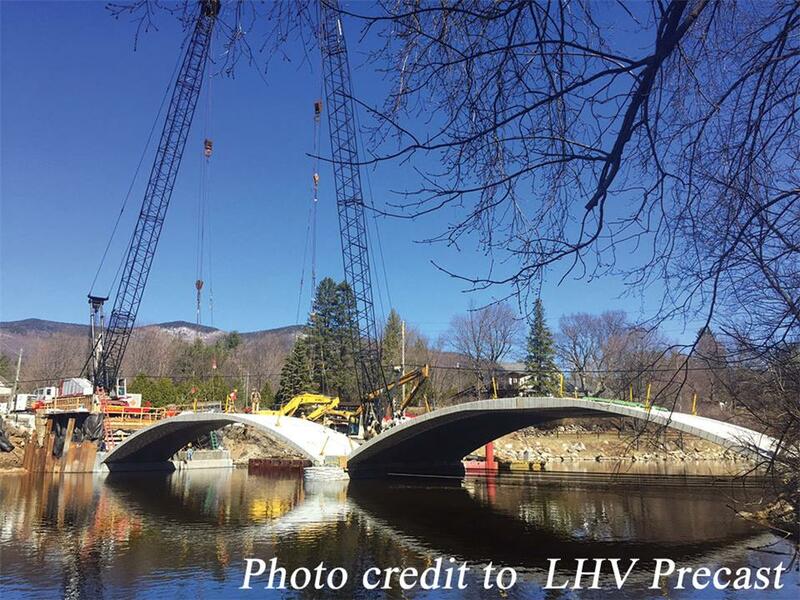 "Faced with a three-mile detour, weather concerns, and the need to maintain the historic look of the bridge, precast arch elements were selected as the material of choice for the new structure," agreed Jim Willis, Vice President with LHV Precast, the project's precaster. "The accelerated schedule afforded by the use of the BEBO structure was much appreciated by those inconvenienced by the construction activities."